Providence's historic downtown area is famous for its many beautiful national landmarks, making it the ideal place to have your engagement photography session. 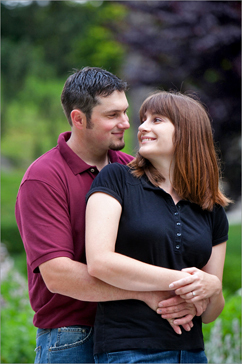 Start off your engagement photo shoot at the stoic Providence Athenaeum. Have your engagement photographer arrange a romantic portrait beside the elegant stone sculpture that stands at the front of the building. You can then take a few seated photos on the steps leading up to the library. Afterward, have your engagement take some photos of you and your fiancée in between the two towering Doric columns, as well as in front of the wooden entrance door. Finally, your photographer can take some photos of you and your man near street level, using the library’s gorgeous Greek Revival architecture as a backdrop. Once you've finished at the Athenaeum, head over to Providence's First Unitarian Church, located only a few blocks away. Here you can begin by taking pictures on the verdant lawn in the foreground of the building, either relaxing on the grass or posing beneath one of the large shade trees. Your engagement photographer can then create an intimate portrait of you and your fiancée in front of the immaculate entrance door. Afterward, have your photographer take some photos of the two of you seated on the front steps or beside one of the four majestic columns. Finally, take a short drive over to Burnside Park, located in the heart of Downtown Providence. The elegant fountain in the center of the park will serve as a perfect location for a portrait of you and your fiancée. You can also pose for some photos seated on one of the benches scattered throughout the park. 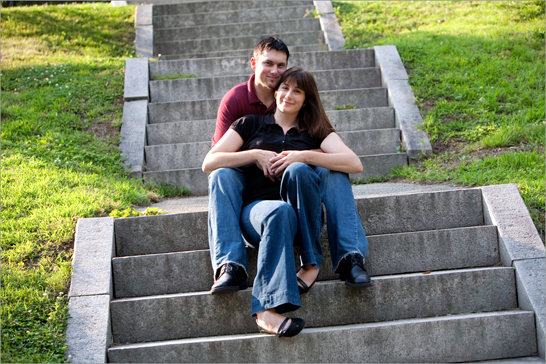 To conclude your engagement photo shoot, take a promenade around the park as your engagement photographer captures some candid photos, using the surrounding Providence cityscape as a backdrop. One of the most popular recreational parks in Providence, India Point Park has become a favorite engagement photography location for Rhode Island couples looking to tie the knot. Once you arrive, take a leisurely stroll with your fiancée along the park's winding pathways as your photographer takes some candid photos. Afterward, pose for some relaxed photos on the lush green lawn or seated on one of the benches, looking out toward the waterfront. You and your fiancée can also pose on the park’s newly built pedestrian bridge for some romantic photos. Finally, walk out toward the water and have your photographer take some fabulous photos of you and your fiancée among the rocks. Take a short drive about a mile and a half from the park to arrive at a photography location that you won’t find in many other engagement albums! Though not your typical photography setting, the Narragansett Electric Plant is one of those rare finds that you and your fiancée can spend hours exploring and that your engagement photographer will absolutely love. Walk along the dock that extends into the water and have your photographer take some photos using the sparkling Providence River as a backdrop. Your engagement photographer can also arrange a photo with the plant’s three large towers in the background. For a vibrant and unique photo, pose in front of the large red construction crane. Take some time to walk around the plant and you’ll find a bunch of old warehouses and junkyards that will work well for some worn and weathered photos. Known to locals as “The Jewel of Providence,” Roger Williams Park is the most popular urban park in the city and is famous for its vibrant collections of floral treasures. Start off your engagement photo shoot at the Roger Williams Botanical Center, the largest public indoor garden display in the entire New England area. Visit the Conservatory and take photos with an exotic waterfall as a backdrop. As you explore the various colorful floral exhibits, pause for photos beside the sparkling fountains or next to the tranquil fish pond. Afterward, head over to the park’s Japanese Garden, whose peaceful setting will make a perfect location for your engagement photography session. Pose with your fiancée on the wooden bridge that crosses over the water. The Japanese Garden also has numerous stone statues sprinkled throughout that your engagement photographer can utilize as elegant props. You can also have your engagement photographer create an intimate portrait of you and your fiancée beneath one of the garden's bonsai trees. Finally, visit the park’s Victorian Rose Garden, which contains a secluded chapel area where you and your fiancée can pose for photos, surrounded by an array of rose bushes.